Steam cloud save is a pretty nice feature. It will automatically backup your game saves online and sync it with any computer, laptop or Steambox you may have (I love the Alienware Alpha!). The biggest downside to it, and it’s a biggie, is that not every game supports it. GOG (Good Old Games) doesn’t support this feature at all [until recently, but still very spotty on game support]! Sync any folder on your computer. Not just one folder, as many folders as you want. No other plugins or software needed! Also shows up as drive P on your computer. Drop any folder into the drive and it’ll sync “to the cloud”. Support for Windows, Linux and MacOS, including SteamOS! Very competitive pricing. 20 GB free, 500 GB for $3.99 and 2 TB for $7.99. But the key feature for this article is how to backup your Steam cloud saves. 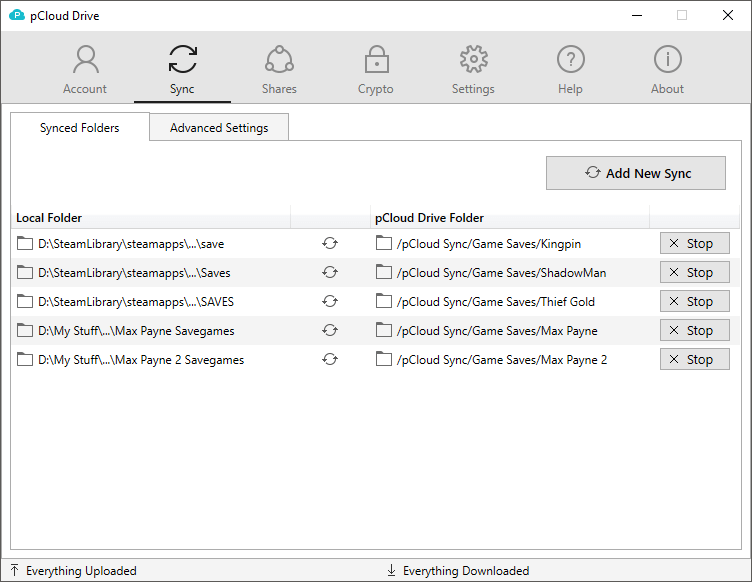 So all you basically need to do is point one of the sync folders to your games save folder. I also have a dedicated Save folder in my pCloud drive that I point to for each game. If you can’t find the save location of the game, you can always Google search for it. Then voila, your game can now be synced automatically online, just like Steam Cloud! You may also wonder what you could use the P drive for? I use it for game mods, patches, guides, all the GOG bonus files you get when buying from them. You can try pCloud out for free by clicking here.